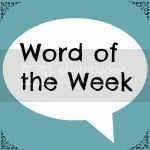 Share the post "Word of the Week 30/1/15"
Hello and welcome to Word of the Week! It’s that time again where I sum up my week in a word, and invite others to do the same. I do enjoy pausing and thinking back over my week, and looking for an overriding theme. And I thank those of you that take the time to do the same and then link up with me here. It’s a pleasure to have you all. – I started running – hooray! For exercise, that is, and it’s still at the stage where my entire body aches. – Boo had her first swimming lesson. Getting her swimming has been on my radar for a long time since she had a disastrous start as a toddler and hated her swim lessons. It’s just been a case of trying to find a suitable time, the right class and the right venue. Fortunately, one of her friend’s mums mentioned that her son was starting on Saturday and it was perfect for us, so I booked her straight in last week, and she went to her first lesson on Saturday. She loved it! It was so lovely to see her enjoying it, and I feel like a huge box has been ticked there. – We bought and installed a new post box. Well, the Husband installed it. After living here for nearly ten years, it finally happened. I lost the post box key! I searched high and low before conceding that I may have thrown it in the bin, so a new one was ordered, it is now up so I needn’t fear the postman wedging a huge envelope in the old one and blocking up my post supply, and I have a spare key, too! – I’ve given the bathroom a makeover. We had our bathroom refitted several years ago, and though I still like it, it’s been looking a little tired. So this week, we ordered some new flooring, which has already been fitted, and got a few new accessories and shelving up, along with the excitement of digging out the old sealant (how do you keep mould off those things?) and redoing it so it all looks sparkly clean and fresh again. – I finally, finally, completed my tax return! Yes, I left it a little late and it actually didn’t take me long to do either, but I’d been putting it off, and now it is done. – I arranged several lovely blog give-aways for you all. I love treating my readers, so I’d been meaning to sort this at the start of the month, but I got there in the end, and there are now several running here – do take a peek! Of course, all of this productivity has me yearning to get more things done, so my list continues to grow…! Beth Twinderelmo recently posted…Why Won’t My Child Eat? It certainly sounds like you have had a very productive week, long may the productivity continue! I would love to start my children at swimming lessons, they have never been swimming before at all and I feel awful about that. I don’t want them starting school swimming lessons in a few years time and being the only children who can’t swim! Good luck with the running, I’m trying to get back in to running too but it’s so painful at the moment! Mommy’s Little Princesses recently posted…Word of the week #4 – Frustrating! Very appropriate word for your week. Well done on the bathroom, the tax return and esp the running. `Iona@Redpeffer recently posted…Following heart or head? You have been busy….It sounds like you have got loads done! Well done! So glad Boo’s swimming lesson went well…. Kim Carberry recently posted…A bit boring and a bit blah! Sounds like you’ve had a good satisfying week. Good luck with the running, I am still running, but it’s been so cold lately, I am struggling. Oh I love home make-overs! Congratulations on taking up running. I used to run in the past and I’ve been thinking of doing it again, but my ankle has never really fully healed! Besides, it is too hilly in Bos. If I were younger and had better ankles, I’d probably go for it too 🙂 #wotw. Wow very productive indeed! Wish my renovations / updating went so quick! Do you have any bathroom make-over pictures? It has been! Nope, not taken any actually – not like me! Such a great word and so many things done. It feels great to tick things off! It really does! I must do more! Mel recently posted…Is School all that Different in France and in England? Busy and productive! I want to go back to running now inspired by you! Good luck with the swimming. We avoided it for so long with our kids (mainly because i was terrified of them drowning!) but now we are all going once a week as a family and my eldest is having lessons. They are all loving being in the water and it is such an important skill to master. She seems keen, and I plan for my son to join her when he turns 3, too – fingers crossed it’ll all go smoothly now! Now, that sounds like the perfect week to me! I would be astonished to have achieved so much, especially the running bit! I hope you continue to get things ticked off your to-do list (along with plenty of time for R&R!). I was pleased! Might rest a bit more this week…! FINALLY, I was able to write a WotW post and join in on the link-up. So sorry it has been a few weeks! You definitely did have a productive week. I am rather envious as my week was mundane! lol Thank you for hosting WotW every week, I love participating in it!